We usually say that the shop floor is the heart of a manufacturing enterprise and that, it should be well-oiled to ensure continuous production. However, there are fewer mentions about how sales is the oxygen that keeps the enterprise alive. For, the lack of sales would keep the shop floor idle and leave the enterprise in a state of turmoil. What are the factors affecting Sales in a Manufacturing Enterprise? Manufacturers especially from the small and medium segment rue the lack of time needed to iron out sales and order management issues. They are busy fire-fighting issues pertaining to shop-floor, production planning, inventory, supply chain and after-sales support etc. as they want to overtake their rivals in the increasingly competitive market. Their sales machinery is completely outdated and manually run, leaving them in a tight spot on deciding what workflows; processes to automate and how. This is where an ERP comes in. Gone are the days when prospects wanted to know about your product and filled a physical/online form or called to your number to enquire. That was considered as lead, sales personnel explained the product benefits at length and convinced you to buy it. The practice might be still prevalent. However, with majority of the selling going online, buyers have evolved to a large extent and have already read about your product, product reviews, product comparisons on the internet before they approach you for a demo. This has completely altered the sales behavior and manufacturers have to reinvent themselves by ensuring quality product content through relevant mediums (website, social media, e-commerce portals) that is readily accessible by prospects. Having an e-commerce portal and a well-designed website with accurate, quality content at strategic places and relevant call to actions are the need of the hour. Most manufacturers have been in the industry for a long time, grew and sustained their business with the help of traditional and word-of-mouth marketing methods. However, with rapid emergence of internet, social media, mobility and cloud, they suddenly feel out of place. Enterprises who quickly adopted digital technology and Social Media as their new sales platform quickly grew to prominence and overtook the others. The others got stuck in old traditional methods and became clueless about how to make the switch. The global manufacturing market is very volatile owing to delicate economic conditions, trade agreements and sanctions, wars & conflicts, stock markets, demand fluctuation, increasing operational costs, fluctuating labor availability etc. While a manufacturer cannot do much about bringing a positive change to these factors, they always can shield themselves to an extent by adopting technology and becoming more proactive. Inside the Manufacturing Enterprise – What’s wrong with their existing Sales Management system? A manufacturer’s market success depends on how fast they can respond to prospect’s Request for Quotation (RFQ), prepare an accurate quotation, and dispatch it at the earliest. But most of the times, manufacturers aren’t able to do this. They have to manually compile product & component pricing, inventory availability, personnel & machine availability, current production schedule, BOM, parts details etc. and prepare a quotation. This takes up immense time at the cost of losing the order to competitors who reach the customer much earlier. Remember, the market is fiercely competitive and every second counts. Customers have placed an order, but they do not know the status of what’s going on and when it would be delivered to them. They do not have access to invoice details, material certifications, sales invoice, shipment details, location tracking etc. The absence of a system that provides complete sales & order visibility to customers affects their business operations as there is an air of uncertainty over their order. This diminishes the trust they have on the manufacturer. In the absence of an ERP/CRM, prospect enquiries and leads are manually recorded and stored in spreadsheets, papers, notebooks, notepads etc. These become primary data containers in a manufacturing enterprise. Work orders are manually generated with inputs from the Sales Order and delivered to the shop floor. The chances of inaccurate data is high as they are prone to human errors. In addition, the shop floor has little visibility over how many work orders they have to cater to on a particular day/week/month. Historical records required to forecast sales and demand are missing, incomplete and inaccurate. All these greatly reduce the efficiency of the manufacturing enterprise and places it way behind competitors who have automated these processes. Customers will call to ask the status of a job, delivery timeline, shipment details, invoice status etc. As all data is stored in various physical forms and spreadsheets, it becomes difficult for service personnel to quickly search for the exact detail and provide an appropriate answer. This will only lead to the personnel apologizing for the delay and requesting for more time to search the information and revert. Also, service technicians visiting the customers for repair do not have any means to access historical customer data, product manuals, spare parts availability thereby reducing their efficiency. All these leave the customers irate, frustrated and reduces the service reputation to a nought. Suppliers are the most vital link for a manufacturer as they are the primary source of raw materials, semi-assembled parts, consumable products, equipment etc. Not having the right communication channels with suppliers has an adverse impact on sales and production. When manufacturers do not know when the shipment will arrive, they are clueless about when the product will be manufactured and delivered to the customer as per the agreed time. This puts the entire production and customer interaction team into chaos and severely damages market reputation. Watch this space to know more about how an ERP helps optimize your Sales Funnel! I think using a sales management or similar software can helps manufactures to get rid of lot of problems. Hello Div, Thank you so much for following our blog! You are absolutely right. 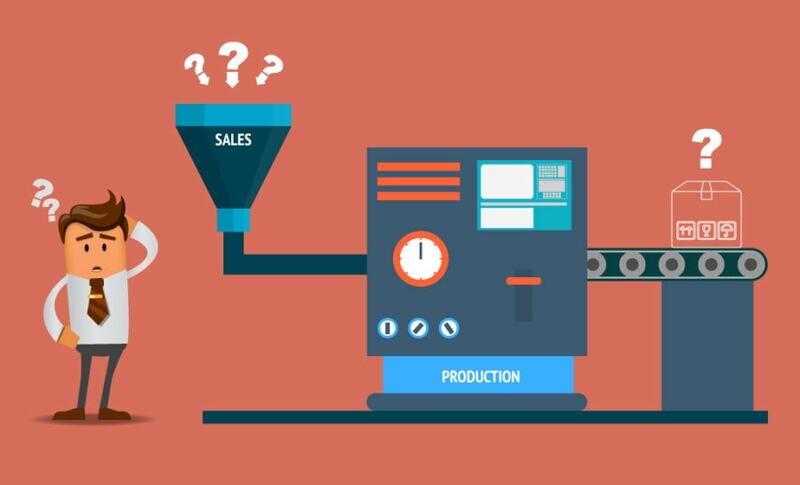 An ERP software that has a built-in Sales Management module integrated with other manufacturing modules is the perfect fit for the problems highlighted in our blog. A follow up blog that mentions how an ERP solves these problems will be published this week. Do not miss reading it. Stay tuned!